Lorena G is, an art director, illustrator, and graphic designer based in Barcelona. It's been more than one year we encountered with her works. And now we had chance to do an interview with her! She is also a huge fan of the movie "The Grand Budapest Hotel" by Wes Anderson. 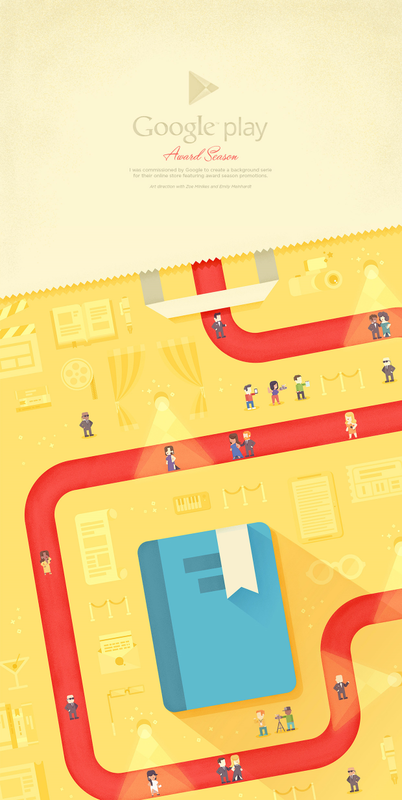 Therefore she captured the cinematic aesthetics of the movie and translate it into a flat design style. If you like her works, then have a look and check out the interview and her website! It was really nice to find out your works. They are really amazing! Could you tell us a little about yourself? Many thanks, really appreciate it! Basically I’m a self-taught graphic designer and illustrator currently based in Barcelona who loves geometry, bold colors, fine vectors and tuna makis. 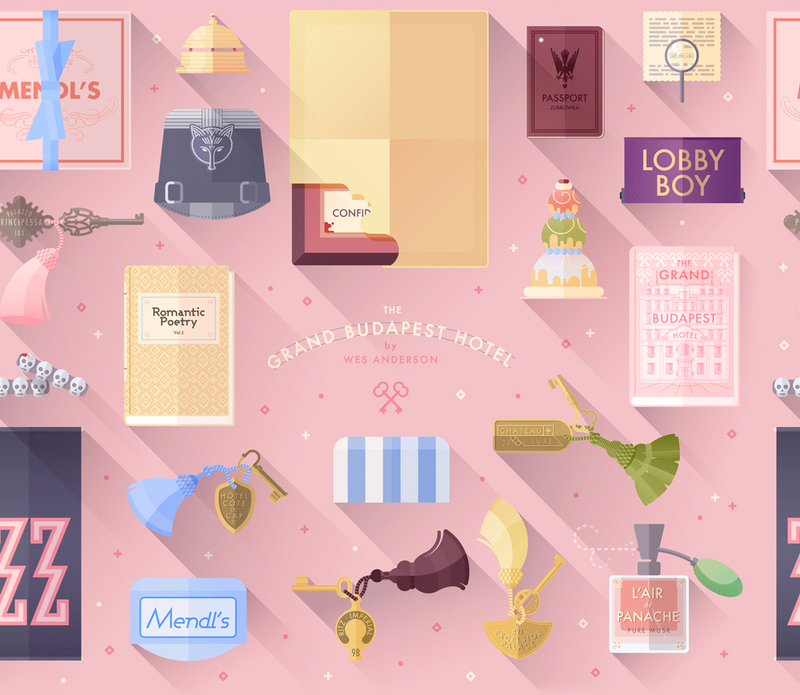 You created huge illustrations series of The Grand Budapest Hotel. I would say -as a huge fan of Wes Anderson- your flat illustrations are gorgeous! What is the story behind this project? Oh thank you, you’re very kind! Actually this project began as a little tribute to the film The Grand Hotel Budapest just for myself, just for fun. I got out the cinema and thought about the many beautiful details that appeared, as in every Wes Anderson movie, of course. How did you decide to illustrate the many beautiful details that appeared in the movie? I was just truly fascinated for the delicious staging and wanted to review the film, frame by frame, looking for those images to illustrate them with care and share so the passion on the details that is present in Anderson's movies. I finally ended up doing a serie of twenty illustrations and thoroughly enjoyed doing it. That’s a very nice idea! Definetly there’re endless possibilities in the huge Anderson universe and I’d love to illustrate them if I had more time. Let’s talk about your favourite director other than Wes Anderson. I love cinema, so there’re a lot of awesome directors I’m really keen on! Specially in science fiction and film noir. Maybe we can talk about Stanley Kubrick, I think Wes Anderson is like the cute version of him! You were also commissioned by Google to create a background series for their online store. What is the most exciting part of being in this project? Everything!!! To be honest was such a surprise… I’m so grateful for opportunities like this! Definitely encouraged me to take more risks and continue developing projects as freelance. Your feeling of living in Barcelona…. How does it effect your creativity? It's a really inspiring city for me as it has it's own personality in every single corner. Plus living close to the sea is priceless! What are the most inspirational artists/designers that inspire you in the world? In terms of inspiration I have a very wide range of sources and references. I don’t just look at things related to my field of work, I simply collect in many different ways everything that inspires or fascinates me. I think it’s about to get closer to the things that inspires you to keep you always motivated, no matter where they come from.